Healthy Latin Eating » Culantro vs Cilantro: Two Distinct Wonderful Herbs! / Condiments / Culantro vs Cilantro: Two Distinct Wonderful Herbs! Culantro and cilantro have been used for centuries in international cuisines such as Thai and of course Latino. Few Latino cooks would actually get culantro and cilantro mixed up, however, for some people is still a bit confusing to differentiate between these two. Culantro, also known as recao in the caribbean islands of Puerto Rico and Dominican Republic is pungent in flavor and its leaves are serrated and elongated. Its cousin herb cilantro has scalloped leaves and its flavor is grassy and earthy. Truth is, culantro is not as nearly as popular as cilantro, but its pungent flavor and aroma make culantro a rather especial herb. To compare the two, let’s just say that culantro is about eight to ten times stronger than cilantro. For that reason, culantro is very much added during the cooking process, whereas cilantro is most often used as a finishing aromatic herb and garnish. Culantro is also one of the main ingredients in sofrito, a cooking base well known in the Latino community. 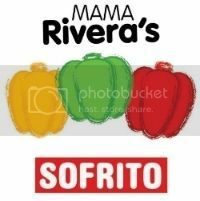 There are a lot of variations to sofrito, but in essence, it is a blend of culantro leaves, onion, garlic, fresh tomatoes and sometimes cilantro. Most of the time, it is made in advance and refrigerated or frozen for later use. Cilantro, also known as Mexican Coriander is milder in flavor and aroma than culantro. Cilantro is most likely eaten raw, very often it’s just chopped and mixed with other ingredients in relishes, salads and salsas that require no cooking.